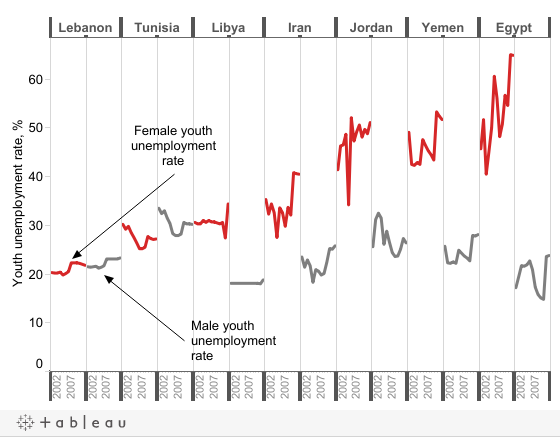 This is the second in a series of blogs based on the July edition of the Quarterly Economic Brief: Predictions, Perceptions and Economic Reality - Challenges of Seven Middle East and North Africa Countries Described in 14 Charts . Hence, most of them get engaged in the informal sector and their jobs provide no security. Informal sectors are large and have been expanding in all of these seven countries in the Middle East and North Africa region. They consist of small firms that are disconnected from the formal sector and suffer from low productivity because of the nature of the sector which requires less capital, less skilled labor and less investment. Workers in the informal sector lack social security coverage and medical insurance and have fewer possibilities to participate in formal education and training programs. These are vulnerable people that most likely live near the poverty line  and are significantly exposed to exogenous shocks. The International Monetary Fund estimates that informality rates across these countries range from 17 percent in Jordan to 35 percent in Tunisia.